The Division is set to receive some much-needed end-game content in the form of raid-like ‘incursions’ next week, as well as some fancy new clothing. Need some help putting together effective gear combos? 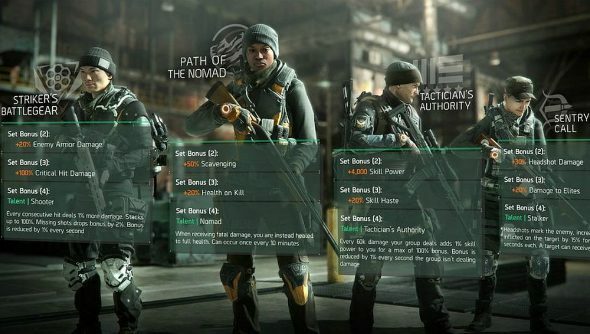 Here’s a character build guide for The Division. Gear Sets, as they’re henceforth to be known instead of ‘outfits’, will offer you some additional bonuses when equipping multiple pieces from the same set. In the April 12 update, version 1.1, you can expect to see four sets of items to equip in each gear slot. The items will be unique drops, named for the set they belong to, with a green rarity indicator, above the highest yellow or gold High-End items. Each set is aimed at a specific character build, with Sentry’s Call increasing headshot damage for Marksmen, Tactician’s Authority providing a massive boost to Skill Power and reducing cooldowns, Striker’s Battlegear increasing your overall DPS and critical damage and Path of the Nomad offering solo Dark Zone stalkers some scavenging and health-on-kill boosts. The bonuses unlock once assembling and equipping more than one of each set, with an extremely powerful Talent unlocked once four of one set is equipped at once. This does mean you can get away without keeping all six items on, as some High-End gear pieces could be more useful in combination.